Orlando, Florida, November 14, 2018 (PERSPECTIVE MAGAZINE) staySky® Vacation Clubs, the award-winning, family-friendly vacation club, and resort group based in Orlando, FL is proud of its employees who participated in the American Cancer Society Making Strides Against Breast Cancer Walk which was held on Saturday, October 28th. The American Cancer Society Making Strides Against Breast Cancer Walk continues to be one of the largest events in support of fighting breast cancer and raising awareness about getting routine breast cancer screenings. Every year, hundreds of communities across the United States join together in solidarity to provide hope to those who have been impacted by breast cancer. 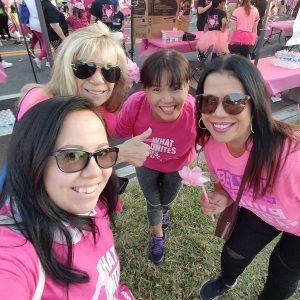 The money raised through this non-competitive walk in Orlando helps people locally by supporting programs such as Reach to Recovery (free transportation services) and has also been able to fund a multi-year grant worth $680,000 to M.D Anderson’s Cancer Center/Cancer Research Institute. staySky® Vacation Clubs has been known for its dedication to philanthropic efforts, however, this is the first time the resort group has participated in the American Cancer Society Making Strides Against Breast Cancer Walk. “As an organization, it is important that we give back to our community and as equally important that we provide a way for our valuable team members to participate in those all-important efforts”, stated Randy Steinbeck President of staySky Vacation Clubs. Earlier this year, staySky® Vacation Clubs volunteered at the Second Harvest Food Bank of Central Florida. The team at staySky® Vacation Clubs packed 11,100 lbs. of onions, 5,100 lbs. of dry groceries, 3,000 lbs. of Carrots, and helped to provide 16,500 meals to the Central Florida community. Named one of Orlando’s top 100 companies to work for, staySky® Vacation Clubs prides itself on in its positive corporate culture that stresses the importance of its employees to engage in activities that directly make a positive impact on their local community and beyond. staySky® Vacation Clubs owns and operates four resort properties in the most popular areas of Orlando. Lake Buena Vista Resort Village & Spa, Hawthorn Suites Lake Buena Vista, staySky® Suites-I Drive Orlando, and Enclave have been awarded multiple times by influential travel websites such as TripAdvisor, Hotels.com, and Booking.com. Through the company’s partnership with Interval International, staySky® Vacation Clubs members can travel the world and have the option to stay at close to 3,000 properties worldwide. Along with the club’s superior benefits, staySky® Vacation Clubs’ members know that when staying at one of the club’s properties in Orlando, they will be treated like family from a staff that is dedicated to providing the best hospitality and vacation experiences possible.